MLB.com's Ian Browne has some great info today on contract clauses for some recent Sox signees. Since I've speculated in this space on some contract details like opt-outs, I felt it appropriate to follow up based on Ian's reporting. There's definitely more over on his blog, particularly involving player performance incentives, so check out the link. First, a quick note on opt-out wording: unless specified otherwise, the clause is worded that the player may be "released if requested" or added to the pertinent roster within 24 hours. If not on Major League roster, may sign with an Asian team for escalating amounts based on date: $50,000 before Feb. 19, $75,000 between Feb. 19 and April 3, and $100,000 if after April 3. Take: Carlson didn't seem like an obvious opt-out candidate to me. His deal definitely keeps his options wide open if he doesn't make the club. The April 1 opt-out looks more like a safety valve to me if he's getting sniffs from other MLB teams, with the "60-game" clause being his true nuclear option opt-out. The Asian team clause is also interesting to me - if he's buried on the depth chart in Pawtucket and a team in Korea or Japan is interested, he can bolt at any time, for a price of course. Take: Nothing too surprising. Looks like he may get a month or two in Pawtucket after all though. Noteworthy that he apparently has no opt-out. Might be understood that he'll be in Boston? Take: Not surprised and pretty much exactly the opt-out I expected he'd have. UPDATE, 10:00 PM: The last player I wonder about is John Maine, given that we now know he got an invite to major league spring training. UPDATE, 2/1: Thanks to Tim Britton of the Providence Journal for confirming that John Maine was not, in fact, invited to spring training. Just a minor league deal. Plenty of moves have gone down since the last First Take, so let’s get right down to it. Padilla is the most significant addition to the Flying Spaghetti Pitching Monster the Sox are assembling to compete for spots on the staff this spring. Padilla, a workable option as a starter as recently as 2010, made 9 appearances in the majors for the Dodgers last year, all out of the bullpen, before going down in May for the season. Reportedly, the club will look at him as both a potential starter and as a reliever, and his chances of being used in the former role obviously will change based on whether the club signs a starter like Roy Oswalt or Edwin Jackson, or trades for Gavin Floyd. As with his fellow competitors for a rotation spot, Aaron Cook and Carlos Silva, I sincerely doubt Padilla sees Pawtucket, unless it is on a rehab or short-term basis, “minor league contract” or not. If he fails to make the rotation, Padilla, who was briefly the Dodgers’ closer last spring, could slot into a middle-inning relief role in front of Andrew Bailey, Mark Melancon, and whoever of Alfredo Aceves and/or Daniel Bard goes back to the bullpen. It may not be “great” depth, but Ben Cherington is putting together the most open pitching competition this club has seen in years. All of the pitchers trying to make the roster, as previously discussed in this column. This one is an obvious salary dump, as Scutaro would have counted for $7.5M against the Competitive Balance Tax and the Red Sox planned on spending that money in other ways. Scutaro has been much discussed, so there is little for me to talk about here. Mortensen’s value comes in his having one option remaining. As I will get to below, the Sox have a glut of relievers who are out of options on the 40-man roster. Mortensen, a sinkerballer, could provide a depth option both in the rotation and bullpen. He has pitched mostly as a starter, particularly in the minors, but was being used extensively in relief for the first time as a pro last June before being sent back to Triple-A, where he went back into the rotation. Scutaro’s departure means Mike Aviles and Nick Punto stand to pick up the playing time at shortstop. However, one thing I wonder – does this give Arnie Beyeler and the Pawtucket coaching staff a tool to light a fire underneath Jose Iglesias? To be frank, there really is nothing keeping the young Cuban from the starting shortstop job in Boston at this point but himself – had he hit enough last season to earn a promotion to Boston, the trade of Scutaro would have been a foregone conclusion. Not that work ethic has been a problem, but maybe this is the carrot that will spur Iglesias to produce at the plate. As for the pitchers – it’s been covered. In a move perhaps made more necessary by Carl Crawford’s wrist surgery – although he will supposedly be ready soon after the season starts – the Sox shored up their outfield by signing Ross with money that could be said to have been freed up in the Scutaro trade. Ross likely slips into the right-handed half of a platoon with Ryan Sweeney in right field once Crawford gets healthy. As for Atchison’s DFA, this was necessitated by the aforementioned glut of pitchers without options on the 40-man roster, which still includes Matt Albers, Michael Bowden, Felix Doubront, Andrew Miller, and Franklin Morales. Assuming a 12-man staff with seven spots already locked up (Josh Beckett, Jon Lester, Clay Buchholz, Bard, Aceves, Bailey, and Melancon), Atchison would have had to beat at least one of those five for a roster spot or get DFA’ed anyway, and that assumes the Red Sox will not acquire another starter and ignores the presence of Padilla, Cook, and Silva. Do not be surprised if another pitcher from that group is traded or designated for assignment before pitchers and catchers report. Darnell McDonald may no longer have a roster spot once Crawford is healthy. Atchison’s DFA creates temporary breathing room for the pitching glut, but would he accept an assignment to Pawtucket? Stunningly – to me at least – this contract does not include an invite to major league camp. For a player with MLB experience like Maine, one would have expected that the club at least get a look-see at him in big league camp. However, the club is apparently committed to looking at what Maine can bring to the table as a reliever, and there appears to be some understanding that this adjustment could take some time as Maine has made all of 7 appearances out of the bullpen in 220 professional games pitched. Again, this is one less spot on the Pawtucket pitching staff. This further fuels my speculation that the Red Sox do not intend for players like Padilla, Cook, and Silva to spend any significant length of time in Triple-A, as the team is busting at the seams now with MLB/AAA pitchers. UPDATE, 1/30: According to the Red Sox website, Maine did indeed receive an invitation to Spring Training. Makes sense. UPDATE, 2/1: Thanks to Tim Britton of the Providence Journal for confirming that Maine was not, in fact, invited to major league spring training. The Red Sox website is incorrect. In the grand tradition of Michael McKenry, Paul Hoover, Gustavo Molina, and Carlos Maldonado, St. Pierre will be the third catcher on the Pawtucket roster behind Ryan Lavarnway and Luis Exposito, the equivalent of a third quarterback on an NFL roster. Although it is quite possible, even likely, that St. Pierre succumbs to the dreaded “right calf strain,” or whatever this year’s equivalent will be, and begins the year on the disabled list, do not be surprised if he stays active on the PawSox roster. The benefits would be twofold – 1) the PawSox will be able to DH Lavarnway and Exposito without worrying about injury forcing the pitcher to hit, and 2) it gives the club some more freedom to have Lavarnway get some work in at first base to give him some more bench versatility at the major league level. To his credit, St. Pierre has played the good soldier for much of his career, and his career trajectory is somewhat fascinating. He first reached Double-A in 2002 (he technically reached Triple-A that year as well, but just played one game at that level). He remained in Double-A Erie for the next three seasons, finally getting the bump to Triple-A Toledo in 2006. He understandably sought greener pastures in 2007 in Milwaukee, but played just 10 games and went back to Detroit in 2008, splitting his time between Erie and Toledo since and even getting a September call-up in 2010. For the Sox, he’s a depth option in Pawtucket and possibly even Portland in case of injury. None. St. Pierre is a depth signing and will probably only be active if a catcher between Boston and Portland is injured. The signing of one more high-minors catcher is no surprise. Australian Baseball League - Play concluded January 22. Playoffs began January 26. Mitch Dening (Sydney Blue Sox): Dening's Blue Sox took three out of four games in their first round matchup against Adelaide to move on to face Melbourne in the preliminary finals. Dening went 2 for 17 in the series, notching a double and two runs scored. Colombian Winter League - Play concluded January 23. Playoffs began January 24. Reynaldo Rodriguez (Monteria): Rodriguez helped lift his squad into the Colombian League finals against Toros. Rodriguez went 2 for 14 with a run scored in the first four games of the series as Monteria trails in the Toros 3 games to 1. Mexican Pacific League - Play concluded on December 30. Playoffs began January 1. Tony Thomas (Algodoneros de Guasave): Guasave lost their final two games as they were swept 4-0 in the Mexican League Championship by Obregon. Thomas went 1 for 8 in the final two contests. Dominican Winter League - Play concluded on December 21. Playoffs began December 27. Tony Pena (Aguilas Cibaenas): Pena picked up the loss on the 28th as he hurled 2.0 innings of relief, allowing 2 runs on 3 hits and a walk, striking out 2. Aguilas is currently tied 4-4 in their best of 9 championship series with Escogido. The ninth and deciding game will take place this evening. Baseball America is reporting that the Red Sox have signed catcher Max St. Pierre to a minor league contract. St. Pierre, who will turn 32 in April, comes to the Red Sox after spending nearly all of his 15-year career in the Detroit Tigers organization, save for a one-year dalliance with Milwaukee in 2007. He will most likely provide depth in Pawtucket behind Ryan Lavarnway and Luis Exposito. St. Pierre had a good year in 2010, posting an .832 OPS between Double-A and Triple-A and making his major league debut as a September call-up, but his offense regressed in a big way in 2011, his OPS dropping to .541 in 260 Triple-A plate appearances. Because St. Pierre is an older prospect, there have not been too many recent scouting reports on him, but a 2003 article from Baseball America states that he is a strong defensive catcher. According to multiple media reports, the Boston Red Sox have signed former New York Mets starter John Maine to a minor league contract. Maine's agent, Rex Gary, told the Fredericksberg Freelance-Star that the Red Sox said they intend to use him as a reliever. The 30-year-old right-hander last pitched in the major leagues in 2010 with the Mets, going 1-3 with a 6.13 ERA in 39.2 innings of work over 9 starts undergoing season-ending surgery on his right shoulder, his second season-ending surgery in as many years. Maine made 11 starts with the Colorado Rockies' Triple-A affiliate in 2011, allowing 38 earned runs in 46 innings with opposing batters hitting .315 against, resulting in a 7.43 ERA. He left the team with a 1-3 record, reportedly to consider retirement, although Gary refuted those reports in the Freelance-Star piece. In 2007, Maine was a career-best 15-10 with a 3.91 ERA in 32 starts with the Mets at age 26. The Red Sox announced today that they have renewed their Player Development Contract (PDC) with the Lowell Spinners for two more seasons. The Red Sox and Spinners, who play in the New York-Penn State league, will now continue their relationship through the 2014 season. The Spinners have been affiliated with the Boston Red Sox since they moved to Lowell prior to the 1996 season. In 1998, they moved into Edward A. LeLaucheur Park where they had a 413 game sellout streak, clearly showing the strong support of the community. Red Sox Director of Player Development, Ben Crockett, made a point of emphasizing this when he made the announcement today along with Spinners owner, Drew Webber, and President/General Manager, Tim Bawmann. "The Spinners organization and the community of Lowell really embrace our young players and provide them an exciting introduction to Red Sox Nation. Drew Weber, Tim Bawmann and the entire Spinners staff foster an excellent atmosphere for development and we look forward to our continued partnership," Crockett said. Over the 21 year partnership, many past and current prospects have made their way through Lowell, including current Red Sox Clay Buchholz, Felix Doubront, Jacoby Ellsbury, and Kevin Youklis. Prospects expected to begin the year in Lowell include some of the Red Sox 2011 draft picks such as Cody Kukuk, Mookie Betts, Jordan Weems, and Williams Jerez. The Lowell Spinners will continue to act as the Short-Season-A affiliate, joining the Pawtucket Red Sox (AAA), Portland Sea Dogs (AA), Salem Red Sox (High-A), Greenville Drive (Low-A), Golf Coast Red Sox (Rookie), and DSL Red Sox (DSL) as the Red Sox minor league organizations. BOSTON, MASS. -- Rookie lessons are a reality for any professional baseball player. The grind of the road and playing every day from spring training through the Fall Instructional League, adjusting to professional pitching, and dealing with slumps and injuries are among the myriad things that every player deals with at some point for the first time. In his first full season as a pro, these are things that Sean Coyle was able to deal with splendidly, en route to his being named SoxProspects.com Rookie of the Year following a promising first full season. Coyle showed great resiliency throughout the year. This included bouncing back from the slumps all players face, but also the occasional injury. The worst injury – and most impressive show of toughness, came when Coyle was hit in the face by a pitch. Coyle has a few fake teeth from the beanball, and he suffered a fractured jaw. However, he missed just 10 games, and somewhat stunningly, had no issues getting back in the box when he returned. Although Coyle’s batting average (.247) and strikeout (110) numbers may not have screamed a successful season, a look at his on-base percentage and power numbers tell a different story. With a .362 on-base percentage, his .115 Isolated Discipline number was the highest for any state-side Sox minor leaguer with at least 100 plate appearances. Similarly, he showed great power for a high schooler in his first full season, adjusting to wood bats by slugging more extra-base hits (48) than singles (47), finishing with a .464 slugging percentage. The 5-8 Coyle did not necessarily say he was surprised by his power display, but he admittedly did not expect it either. Right now, Coyle is preparing for the season back home in Pennsylvania, but he plans to report to Ft. Myers on February 1 in order to get outdoors earlier than he otherwise would in the northeast. With that first full season under his belt, it will be exciting to see what he can do with what pitchers throw at him – both figuratively and, hopefully not, literally – in 2012. Even in the winter, when progress can’t be tracked by stats or scouting reports, every prospect in the Red Sox organization is working toward the goal of playing big-league ball. Many have their own routines; nuanced approaches developed from experience. But a few Sox have been training at a facility that has become synonymous with high-level training for athletes of all ilk -- Athlete’s Performance Institute, shortened by many to “API.” Third baseman Will Middlebrooks and catcher Carson Blair are training at API’s Frisco, Texas, location alongside major-leaguers like Angels outfielder Torii Hunter and A’s pitcher Brandon McCarthy. Check out the full article on ESPN Boston. Jacobs continuing transformation from multi-sport star to "baseball player"
BOSTON, MASS. -- It was a common refrain among those who saw Brandon Jacobs in his first taste of full-season ball after having seen him the season before at Lowell. It was offered as if no further explanation was needed. Now, that phrase could take on a number of meanings. It could refer to Jacobs’ slimmer physique. A running back in addition to an outfielder in high school, it is well-reported at this point that Jacobs had a scholarship offer to tote the rock for Auburn if he had not signed with the Sox. Anyone who saw Jacobs in Greenville last season that had seen him the season before saw a marked change in his body, as he brought a slimmer, more toned physique into the 2011 campaign. The change was intentional. Of course, the whole “looking like a baseball player” label could easily apply to his on-field skills as well. Jacobs earned South Atlantic League Player of the Year honors after a stellar campaign, hitting .303/.376/.505 with 17 home runs and 30 stolen bases in his age 20 season. He at least partially attributed his success to playing left field in a Greenville lineup that boasted an impressive number of the system’s breakout players, including right fielder Bryce Brentz, second baseman Sean Coyle, shortstop Xander Bogaerts, and first baseman Miles Head, all of whom were named SoxProspects.com All-Stars along with Jacobs. Still, Jacobs is not one to rest on his laurels. His game may have taken leaps forward in his two-plus years in this system, but he plans on targeting areas of his game that need improvement this offseason. According to a press release on the team website, the Red Sox announced that they have extended the player development contract with the Greenville (S.C.) Drive through the 2016 season. The original contract was agreed to prior to the 2005 season and was extended twice, with the most recent extension being prior to the 2008 season. The contract would have expired at the end of 2012. The Drive, who play in the Low-A South Atlantic League, have seen many great Red Sox prospects over the past seven years including Clay Buchholz, Daniel Bard, Ryan Kalish, and Ryan Lavarnway. The home stadium for the Drive, Fluor Field, was built in 2006 and has many similarities to Fenway Park, including a 30-foot Green Monster replica in left field. The Drive have had a winning record each of the past four seasons and appeared in the South Atlantic League Championship Series in 2010. To see which players are projected to play in Greenville this season, check out the SoxProspects 2012 Projected Rosters. The guys hook back up after a brief hiatus for the first podcast of 2012, discussing transactions since the last episode, debating their projections for Will Middlebrooks and Xander Bogaerts, and reacting to some audio from New Stars for Young Stars. Mitch Dening (Sydney Blue Sox):Went 7 for 21 with 3 doubles and 3 runs scored in 5 games against Perth. Justin Erasmus (Brisbane Bandits): Notched two saves by tossing 2.2 innings across two appearances. Erasmus allowed 2 runs on 2 hits and a walk while striking out 1 over the two outings. Reynaldo Rodriguez (Monteria): Rodriguez appeared in six contests this week, including both games in doubleheaders on Tuesday and Thursday. He went 7 for 19 with 4 doubles, 5 RBI and 3 runs scored. Tony Thomas (Algodoneros de Guasave): Since the last update on December 30, Thomas has gone 11 for 51 with 2 home runs, 5 RBI and 6 runs scored in 14 playoff contests. Guasave lost their first round match up with Obregon 4 games to 2 but defeated Culiacan in the semifinals to advance to the championship round against Obregon. Guasave currently trails Obregon 2-0 in the best of 7 championship series. Marco Duarte (Aguilas de Mexicali): Has made three starts for Mexicali during the playoffs. On January 2 against Hermosilo Duarte picked up the loss for his 5.0 innings of work, allowing 2 runs on 3 hits and 4 walks, striking out 4. On January 11 against Obregon, Duarte allowed 1 run on 3 hits and 4 walks while striking out 5 in 5.2 innings during a no decision. In a dreadful final start of the winter, Duarte failed to record an out on January 16 against Obregon, allowing 6 runs on 4 hits and a walk, striking out 2. Mexcali defeated Hermosilo in the first round of the playoffs 4 games to 1 before falling to Obregon 4 games to 1 in the semifinals. Tony Pena (Aguilas Cibaenas): Pena has tossed 5.1 innings of relief during Aguilas' playoff run, allowing no runs on 5 hits and 2 walks while striking out 4. Aguilas currently leads Escogido 2-0 in the best of nine championship round. Puerto Rico Baseball League - Play concluded on January 3. Playoffs began January 7. Mike Aviles and Henry Ramos did not participate in the playoffs for Ponce who was eliminated three games to two by Mayaguez in the Puerto Rico League's semifinal. Christian Vazquez has not appeared for Mayaguez who defeated Ponce in the semifinals and currently leads Caguas four games to two in the nine game championship round. A day after the first rumblings of a potential deal in the offing, the Red Sox have traded shortstop Marco Scutaro to the Colorado Rockies for 26-year-old right handed pitcher Clayton Mortensen. The move presumably provides valuable financial flexibility for the Red Sox to spend money at another position, as the organization has been reported to strongly desire to stay below the 2012 luxury tax ceiling. Scutaro will make $6-million this season. Last season, Mortensen split time between the majors and Triple-A for the Rockies. In the majors, he went 2-4 with a 3.86 ERA in 16 appearances, 6 of them starts, allowing 25 earned runs on 55 hits (.257 BAA) in 58.1 innings of work, striking out 30 and walking 26. A former first-round sandwich pick of the St. Louis Cardinals out of Gonzaga, Mortensen is 4-8 with a 5.12 ERA in 24 major league appearances, including 13 starts, over 95 innings pitched with stops in St. Louis, Oakland and Colorado. According to a report by WEEI.com's Alex Speier, Mortensen has one option remaining. Mortensen primarily utilizes an 89-90 mph sinker, also throwing a changeup, slider, and curveball. Mortensen went to Oakland from St. Louis in the trade for outfielder Matt Holliday, and last year was sent to the Rockies in exchange for minor league pitcher Ethan Hollingsworth. Scutaro, 36, played two seasons in Boston showing solid offense for the shortstop position and the versatility to play second base. He will play second base for the Rockies, who already have Troy Tulowitzki at short. Hitting Coach: Gerald Perry - Perry returns to the Boston organization after serving as the hitting coach for the Oakland Athletics in 2011. Perry previously served as hitting coach for Single-A Michigan (1997) and Pawtucket (1998, 2010). Manager: Billy McMillon - Debuts as Salem's manager in 2012 after spending the past two seasons as manager of the Low-A Greenville Drive. Hitting Coach: Rich Gedman - Enters his first year as Salem's hitting coach after serving in the same capacity for Lowell last season. Trainer: David Herrera - Moves to Salem after serving as trainer for Greenville the past two seasons and Lowell (2009) and the Rookie-Gulf Coast League Red Sox (2008). Manager: Carlos Febles - Makes his Greenville managerial debut after serving in the same capacity for Lowell last season. Febles previously served as hitting coach for Salem (2009-2010) and High-A Lancaster (2008). Hitting Coach: Darren Fenster - Joins the Red Sox organization after spending six seasons with the Rutgers University baseball squad, the past three seasons as assistant coach. Fenster also served as an assistant coach for the Cape Cod League's Orleans Cardinals and spent five seasons in the Kansas City Royals minor league system after being drafted by them in 2000. Trainer: Mauricio Elizondo - Joins Greenville after spending the past two seasons in the same role with Lowell. Elizondo originally joined the organization as an intern with the Gulf Coast League Red Sox in 2008. Manager: Bruce Crabbe - Crabbe begins his third stint as Spinners manager after previously leading them in 2006 and 2010. He served as manager of the Salem Red Sox in 2011. Hitting Coach: Nelson Paulino - Paulino comes to Lowell after serving as the hitting coach for the Gulf Coast League Red Sox for five seasons (2001-2002, 2008-2011). Pitching Coach: Goose Gregson - Gregson, a long time coach, briefly served as Boston's interim pitching coach in 2003. He had been the Red Sox Latin American pitching coordinator since 2005. Coach: Noah Hall - Hall joins the Boston organization to make his professional coaching debut after spending 16 years playing professionally. Hall spent time with the Montreal Expos, Cincinnati Reds, Toronto Blue Jays, Chicago White Sox, New York Yankees, Baltimore Orioles, and Seattle Mariners organizations. He spent the past two seasons playing in the independent leagues for the Somerset Patriots and Camden Riversharks. BOSTON, MASS. -- Since being selected with the Red Sox’ first pick in the 2010 draft, Kolbrin Vitek has faced plenty of questions about his future. What position would he play? After a season in the cavernous parks of the Carolina League during which he slugged .372, some have asked whether he has enough power to make it in the majors. However, the fact remains that the Ball State product is pacing his draft class up the ladder to the majors – as one would expect a first-round college pick to do – becoming the first of the 2010 draftees to make it to High-A when he opened the 2011 season with Salem, and presently projected by SoxProspects.com to begin the 2012 season with Double-A Portland along with fellow 2010-ers Bryce Brentz and Anthony Ranaudo. Vitek, drafted as somewhat of a man without a position, understands that he needs to continue improving at third base to man the spot in the majors. In college, Vitek spent his first season at first base, his sophomore year at third, and his junior year at second base in order to lessen the strain on his arm, as he also pitched. The Red Sox chose to slot Vitek at third base, at least to start his development, and while scouts still are not sold on his future there, if he moves, it will not be for lack of effort. The sight of Vitek taking extra ground balls off to the side was a regular part of catching Salem’s pre-game workout last season. Vitek also kept a realistic perspective on his season in the notoriously pitcher-friendly Carolina League. Last season, the only American professional baseball league in which fewer runs were scored per game than the 4.19 from that circuit was the National League. So while Vitek’s .372 slugging percentage looks subpar for a third baseman, it was actually not far below the league average of .379 (compared to .386 in the Florida State League and .430 in the California League). Vitek was aware of the Carolina League’s reputation coming into the year and mindful of it throughout. Once Vitek does officially escape the clutches of the Carolina League, he also knows that he will be just a couple steps from the majors. Although he was “kind of oblivious” about the comings and goings in Boston last offseason, he admitted to paying a lot more attention to transactions at the major league level recently. Who could blame him? Going through the system at this pace, it may not be long before Vitek can sniff the majors. Position Overview: We're looking for a volunteer web content developer to join the SoxProspects.com staff through at least December 2012. The primary responsibility of the position will be developing player pages for new players as they enter the Red Sox minor league system. This job will involve a little bit of commitment, as creation of each player page can take anywhere from 15 minutes to an hour, depending on your skills and depending on the scope of the player's background. On average, the system tends to add about 0-1 players per week during slow time periods, 1-3 players per week during regular time periods (which is most of the time), and larger amounts during heavy periods such as the draft or minor league free agency. We will train whoever gets this position from the ground up on our style guides and the best places to find all of the requisite information. While this position will not be responsible for the creation of every new player page, hopefully the new hiree will take responsibility for creating a large portion of the new pages. This is a great opportunity for an aspiring web/content developer to gain some experience and exposure in the sports industry. Although this is a volunteer position, we evaluate applications based on their professionalism, attention to detail, and merits as if this were a paid job, so please approach your initial email application accordingly. Familiarity with the site is a plus, but level of fandom of the Red Sox will not really be a consideration. This is an unpaid opportunity, as are all the positions on the SoxProspects Staff. However, there are a few nice perks, including access to insider information, invitations to staff events (including occasional games), and networking opportunities. If interested, please email mike@soxprospects.com by 2:00 PM ET on January 25, 2012. Please provide a list of relevant skills and experience with respect to the position. A resume is not required, but can't hurt either. We look forward to hearing from you! We hope to make some decisions in early February. BOSTON, MASS. -- A year and a half after the Red Sox gave him a $1.31-million bonus to sign as a fourth-round draft pick, injuries have held Garin Cecchini to just 133 plate appearances as a professional. A torn ACL was largely responsible for the Louisiana native’s drop from his pre-season first-round projection and kept him from making his pro debut until 2011, when he reported to short-season-A Lowell. After just 32 games for the Spinners, a wrist fracture ended Cecchini’s 2011 season. For fans eager to follow the high-ceiling high school pick out of Louisiana, the past two seasons have been an exercise in patience. To make things worse, Cecchini's wrist injury came at a horribly inopportune time. He went just 5 for 32 from June 16 to June 29, posting a .156/.308/.218 slash line, but Cecchini caught fire from June 30 to his final game on July 23, going 29 for 82 with a .354/.436/.610 slash line. Speaking at the New Stars for Young Stars fundraiser recently, Cecchini credited the turnaround to adjusting to life as a baseball player. 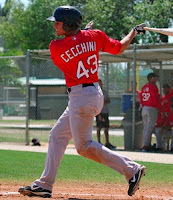 With his wrist now healthy – Cecchini was a full participant in the Fall Instructional League – Cecchini will likely break camp with Single-A Greenville in 2012. Although he did start to figure things out at the plate in Lowell, the high school shortstop continues to work on adjusting to his new position at third base, following a path similar to Sox top prospect Will Middlebrooks. In the meantime, expect to see the Cecchini name making double the news come June, as Garin’s younger brother Gavin is projected to be a first-round pick himself. After going through the process, Garin has given his brother advice on how to approach his senior year and the draft. BOSTON, MASS. -- It would be hard to blame Alex Wilson for getting ahead of himself this offseason. Many a minor leaguer has fallen into that trap before him, and many will after. On the precipice of a major league debut – which, for Wilson, will almost certainly come this season if he remains healthy – players can sometimes spend more time worrying about external circumstances, such as how the major league team is doing and when that first opportunity might come, than about their own performance. Wilson, however, maintains that while he is focused on making the major league roster, he is not distracted by the comings and goings this offseason on the Boston roster. Wilson has been working hard this offseason as well, but not just on the mound. Facing the realities of a minor league salary, he worked mornings at Lowe’s Home Improvement for the first half of the offseason, when many pitchers power down a bit to let their arms recover from the rigors of the season, before stopping around Christmas to focus completely on the coming season. He will begin throwing off a mound this week, looking to replicate a bounce-back 2011 season that saw him named the system’s Pitcher of the Year by both the Red Sox and SoxProspects.com. In 2010, his first full season, Wilson needed just 11 starts in High-A Salem, during which he allowed 24 runs on 43 hits and 15 walks while striking out 50 over 55.2 innings, to earn a promotion to Portland. However, Double-A brought Wilson’s first struggles as a professional, as he allowed 59 runs in 78.1 innings for a 6.66 ERA. He allowed 95 hits, seeing his strikeout rate drop from 8.08 per 9 innings in Salem to 6.43 in Portland. In 2011, Wilson rebounded nicely, providing the prototypical example of why the Sox aggressively promote their prospects, in part to induce such struggles. Returning to Portland, he dropped his ERA back to 3.05 in 21 starts. He allowed 103 hits and 37 walks while posting 99 strikeouts in 112.0 innings. He also applied the lessons he learned in 2010 to his late-season promotion to Pawtucket, where he was even better, striking out 24 batters in 21.0 innings, allowing just 19 hits and 7 walks. Wilson expects that he will be used as a reliever at the start of camp before being stretched out to start, similar to how the team worked him last spring. Many scouting projections have Wilson working out of the bullpen at the major league level, allowing his fastball-slider combination – Baseball America rated both as the best in the system this offseason – to play up. Although Wilson prefers starting, the former Texas A&M closer thinks the transition to the bullpen would not be too difficult. “Being in a constant routine as a starter’s always really nice, but once you get used to being a reliever, you get into your routine there as well. For me, it would be finding another routine. It’s been a long time since I have relieved, but I think the transition would be easy,” he said. Whether Wilson will remain a starter will depend in large part on the development of his changeup to accompany the fastball and slider, something the Red Sox will likely allow him to do with a return trip to Pawtucket to start the year. However, if he picks up 2012 where he left off last season, expect to see him on the major league roster before the year is out. Chris Hatfield is the Executive Editor of SoxProspects.com. Follow him on Twitter @SPChrisHatfield. As first reported by Peter Gammons on Twitter, the Red Sox have agreed to a minor league deal with veteran right-hander Vicente Padilla. Padilla, 34, originally signed as an international free agent with the Arizona Diamondbacks in 1998. The right-hander made his major league debut with Arizona in 1999 before being traded to the Philadelphia Phillies as part of a package for Curt Schilling. After spending his entire career in the bullpen, Padilla was moved to the rotation by the Phillies in 2002 and went 14-11 with a 3.28 ERA, earning his lone career All-Star selection. Padilla boasts a 140-90 record with a 4.31 ERA and a 2:1 strikeout to walk ratio over his 13 year major league career with the Diamondbacks, Phillies, Rangers and Dodgers. Last year as a member of the Dodgers, Padilla appeared in just 9 games out of the bullpen, posting a 4.15 ERA with 3 saves after battling multiple injuries all season. He has been pitching in Nicaragua this winter and has shown that he is pitching well with his normal velocity, giving the Red Sox hope he can regain the form that made him a servicable starter for the better part of the last decade. The Red Sox now seem to have multiple candidates for the fifth spot in the rotation with Padilla, Aaron Cook, Carlos Silva and Andrew Miller all looking to compete in Spring Training. Boss Moanaroa (Sydney Blue Sox): Appeared in 4 games this week as Sydney went 3-2 in its series against Adelaide. Moanaroa was 3 for 11 at the plate with a double, 3 runs scored a home run and 3 RBI. Mitch Dening (Sydney Blue Sox): Dening appeared in all five of Sydney's games this week, going 4 for 17 with 5 runs scored, a double, home run and 2 RBI. Dening and Moanaroa were nominated for the ABL's Fan Choice Award. The voting takes place on the Sydney Blue Sox Facebook page and begins today. Each team in the ABL will have one winner that will face off against the other winners in a final vote. The victor of the second vote will be presented with the fan choice award at the completion of the post season on February 5. Justin Erasmus was one of the candidates nominated from the Brisbane Bandits. Reynaldo Rodriguez (Monteria): Rodriguez appeared in seven contests this week, including both games in doubleheaders on Tuesday and Thursday. The 25-year-old went 6 for 27 with a double, home run, 4 RBI and 2 runs scored. BOSTON, MASS. -- Saturday marked the seventh annual New Stars for Young Stars at Jillian’s Boston, the annual Jimmy Fund fundraiser that gives fans a chance to meet and get autographs from some of their favorite Red Sox, past, present, and future. Sox prospects Garin Cecchini, Sean Coyle, Brandon Jacobs, Kolbrin Vitek, and Alex Wilson were in attendance at the event, joining Sox catcher Jarrod Saltalamacchia, manager Bobby Valentine, and the unquestioned headliner of the event, Sox great Pedro Martinez. This year, in addition to benefiting the Jimmy Fund and Dana Farber Cancer Institute, the event also benefited the Pedro Martinez and Brothers Foundation. The event kicked off with a meet-and-greet between Sox players and patients from the Jimmy Fund Clinic and their families. While Valentine and, later, Martinez, sat at tables signing autographs and taking photos with the patients, the players mingled with the “young stars,” some playing pool with the children while others chatted with families and Wally the Green Monster made the rounds to the delight of the younger folks present. 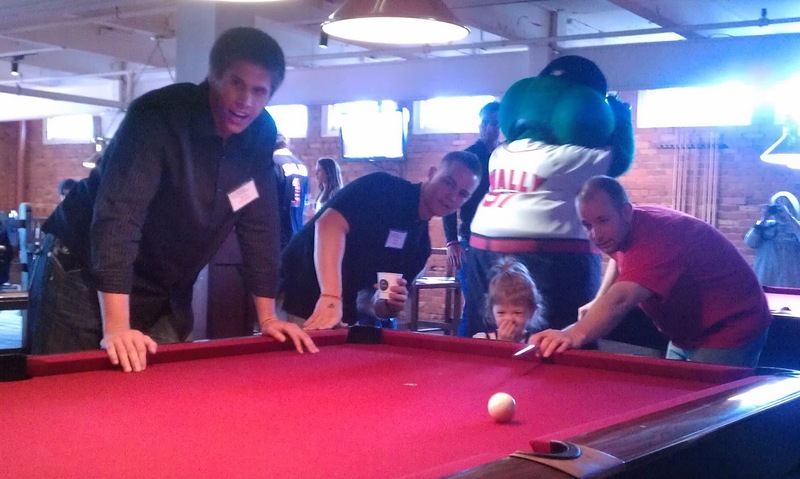 Although the players were all only in town temporarily – Jacobs, for example, will not even be staying the night in Boston – they were unanimous in saying they were happy to attend the event to raise money and put smiles on a few faces. Cecchini, who gave $20,000 of his signing bonus to the Jimmy Fund and participated in the Jimmy Fund telethon almost immediately after signing, echoed those thoughts. “To see the smile on the kids’ faces when you talk to them, it just brightens up your day. The real reason you play baseball is for people like this,” he said. 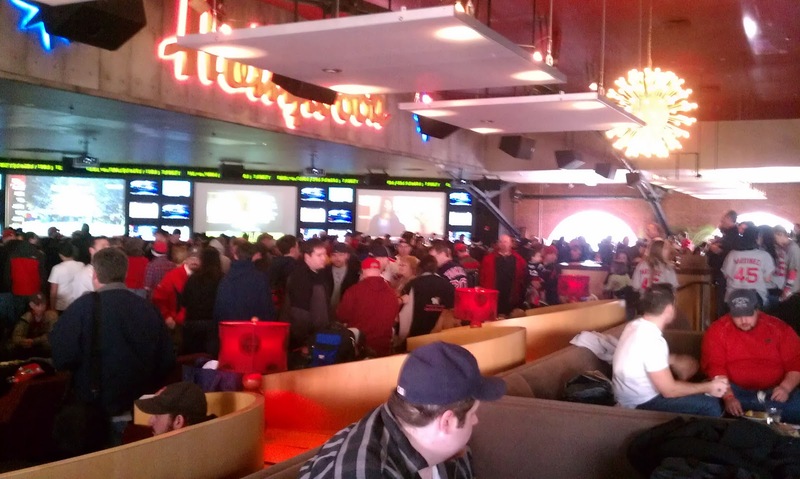 Following the meet-and-greet, the players signed autographs for three hours, while fans had the opportunity to win other Sox memorabilia through a silent auction and several raffles. - He spoke glowingly of his visit to Portland for the Sea Dogs’ hot stove event, and commented about how easy it would be to get up there and see a player rehab if he ever had the opportunity on an off day. - He also said that he visited the under-construction JetBlue Park, the club’s future spring training home in Ft. Myers. He spoke with Daisuke Matsuzaka – in Japanese – and saw a bullpen thrown by Andrew Miller. He also related his experience with one of the drawbacks of the Sox’ old two-field Spring Training setup, driving to City of Palms Park when he was supposed to go to the team’s minor league complex. - Valentine spoke with Carl Crawford this week. Ben Cherington and Crawford’s agent were both on the call as well, which Valentine described as positive. “He’s very determined and very understanding of the fact that things got spinning so fast for him last year and he’s determined to correct that,” Valentine said. - On new Yankee Michael Pineda, he said that Pineda looked “unhittable” early in the season and “okay” in the second half. He also said that Hiroki Kuroda is “probably an upgrade” over Bartolo Colon and Freddy Garcia in the New York rotation, despite leaving a great pitchers’ park in the National League for Yankee Stadium in the AL East. He also spoke about how the Red Sox only have “half of a pitching staff,” that while that half is good, the club is not finished putting it together. - Regarding Tim Wakefield and Jason Varitek, Valentine said that he could not imagine either coming into camp without having a defined role on the team, saying he “couldn’t imagine” either coming to spring training trying to compete for a job. "I'm trying to think if I ever had a guy with a 'C' on their chest who came as a non-roster player," he said. Kalish would not commit to a timetable for his return from shoulder surgery (and who could blame him, given how his 2011 season unfolded?). He said that he learned from the twists and turns of his attempts to return from injuries to his shoulder and neck in 2011, and that he and the club would make sure his shoulder is healthy before he returns to the lineup this year. His response when pressed for an answer on his return when July was tossed out as a potential target was a playful, “That’d be cool.” Somewhere, Bill Belichick silently nodded his approval. 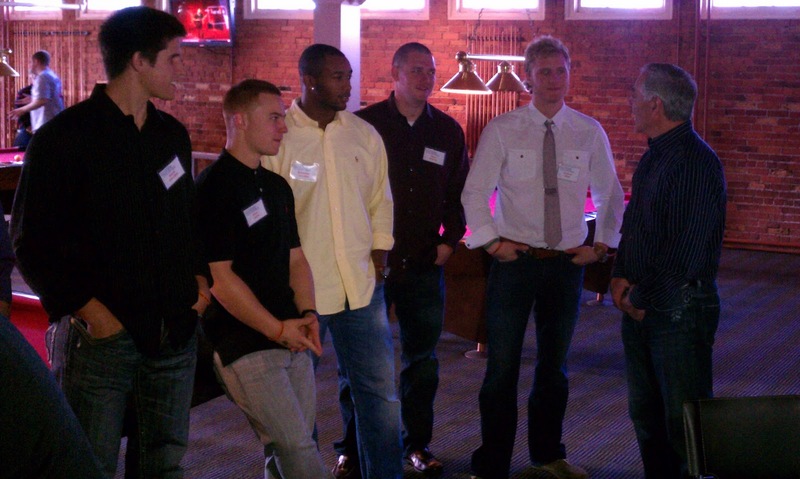 Stay tuned to SoxProspects.com this week, as we will have more from our discussions with all of the players present. After announcing a slew of signings to bolster their pitching depth, the Red Sox added Emaus to augment their infield depth. It made sense for the Sox to add one more legitimate “taxi squad” infielder in Pawtucket. Although this makes for a “one too many” situation in the infield for the PawSox, one need look no further than the team’s 2011 outfield situation to see how quickly depth can turn into a glaring hole. Entering the season with four legitimate starting Triple-A outfielders, the club lost JC Linares and Ryan Kalish to injury early on and saw Josh Reddick promoted to Boston for most of the season, leading to Ronald Bermudez, who probably belonged in High-A, becoming the club’s starting right fielder. As for Emaus himself, as easy as it can be to dismiss his .313/.389/.564 line from last year as a product of playing in a great hitters park in a hitters league, according to the MLSplits MLE calculator, his numbers would have translated to a .302/.378/.531 line in Pawtucket. He can hit, and although Emaus faltered in a short major league audition with the Mets last April as a Rule 5 draft pick, going just 6 for 37, Emaus still has all three options and is a legitimate depth option for the Sox this season should the need arise. Colorado's return will likely be a C-level prospect chosen from a list of players the Rockies' scouts will watch during spring training. A good comparison can be found as recently as last season, when Pedro Perez was sent to Detroit at the end of Spring Training to complete a prior trade for Brent Dlugach. The Rockies' return would be a similar player. Pedro Ciriaco, Nate Spears, Tony Thomas – Since Will Middlebrooks and Jose Iglesias will get their at-bats, there are at most three rosters spots available for Ciriaco, Spears, Thomas and Emaus if everyone in the Pawtucket and Boston infield enters the season healthy. In such an unlikely situation, one player could start the year in Portland or on the phantom DL. Given Spears’ versatility and Ciriaco’s ability to play shortstop, Thomas, who only plays second base, would likely be the odd man out in such a situation. As announced by the team on Twitter, the Red Sox have acquired infielder Brad Emaus from the Colorado Rockies for a player to be named later or cash considerations. Emaus, 25, was originally drafted by the Atlanta Braves in the 18th round of the 2004 amateur draft. Emaus did not sign and enrolled at Tulane University, later being drafted by the Toronto Blue Jays in the 11th round of the 2007 amateur draft. After showing promise and steady improvement during his four seasons in the Toronto system, Emaus was selected by the New York Mets in the first round of the Rule 5 draft after the 2010 season. The 6'0" right-handed hitter appeared in 14 games with the Mets, recording 6 hits and 1 RBI before being designated for assignment in mid-April. Emaus was eventually returned to the Blue Jays and subsequently traded to the Colorado organization. He spent the remainder of the 2011 season with Triple-A Colorado Springs, hitting .313/.389/.564 with 9 home runs and 28 RBI in 45 games. Over the course of a five year minor league career, Emaus has hit .280/.366/.439 while primarily playing second and third base. And… that’s it. In theory, then, there are four spots on the pitching staff that could be up for grabs this spring. Franklin Morales and Matt Albers certainly have the inside track to bullpen spots, but their jobs are not secure enough that they could stink the place up in March and still make the team if they get significantly outpitched by a non-roster invitee. This is why the Spaghetti Monster is growing larger than it has been in prior years. Germano is the 11th pitcher to receive a non-roster invite, and will be competing with the likes of Felix Doubront, Andrew Miller, Michael Bowden, Scott Atchison, Junichi Tazawa and fellow NRIs Justin Thomas, Jesse Carlson, Will Inman, Doug Mathis, and Tony Pena for a roster spot. Some of those players have better chances than others of making the club, but this is shaping up to be the most wide-open competition for roster spots the Red Sox have had in years. As for Germano himself, with 253 major league innings, he has a decent amount of big-league experience. He pitched mostly in Triple-A for the Indians last year after making the major league club out of spring training. He was eventually sold to the Samsung Lions in Korea, and the club offered him a $1 million contract to come back this season. However, he is apparently determined to pitch in the majors. Since spending 2009 pitching in Japan, Germano has logged over 100 Triple-A innings, so he is not an obvious candidate for an early opt-out clause, although he may have required one to turn down Samsung’s offer. Although he has started a fair number of games in recent years – even tossing a perfect game in Triple-A last season – he is a reliever at the major league level, and I would expect him to pitch in that role for the Sox no matter the level. In the end, Germano is another cheap option to throw into the pitching staff competition with the names above, and is probably a better option than many of them. We’ll see what he has this spring. See above list of relievers. Jon Heyman of CBS Sports is reporting on Twitter that the Red Sox have signed right-handed pitcher Justin Germano to a minor league contract. Germano reportedly had an offer of over $1M to pitch for the Samsung Lions of the Korean Baseball Organization, but turned it down for the opportunity to pitch for Boston. He spent the last two seasons in the Cleveland Indians organization. Germano, 29, has appeared in 79 games over six major league seasons, compiling a 8-20 record and 5.20 ERA. While he served primarily as a starter for the Padres and Reds earlier in his career, 31 of Germano’s 32 appearances for the Indians came out of the bullpen. His best major league season was 2010. Appearing in 23 games, Germano had a 3.31 ERA over 35.1 innings pitched, striking out 29 with only 8 walks. Germano split 2011 between Cleveland and the Triple-A Columbus Clippers. He had a 5.68 ERA in 9 major league appearances, but was more effective in 16 minor league appearances, of which six came as a starter. With Columbus, Germano had a 1-2 record with a 4.22 ERA, 1.102 WHIP, 39 strikeouts and 4 walks in 49 innings pitched. The highlight of his season came on July 26. While pitching for Columbus against the Syracuse Chiefs, Germano pitched the fifth perfect game in International League history. He needed just 95 pitches to record seven strikeouts on his way to the first IL perfect game since former Red Sox pitcher Bronson Arroyo’s on August 10, 2003. Germano will go into spring training looking to win a spot in the Red Sox bullpen. If he fails to make the major league roster, he may be used as either a starter or reliever at Triple-A Pawtucket.